I just received a five star review from Matthew Davenport. You can see it on Goodreads.com and Matthew’s blog https://authormatthewdavenport.wordpress.com. You can find the audio version of ‘Healer of Surflex’ https://www.audible.com/pd/Sci-Fi-Fantasy/Healer-of-Surflex-Audiobook/B071KZGFVD. This entry was posted in Reviews and tagged angel, demons, dragons, fairies, faith, family, fantasy, father/ daughter relationship, good verses evil, healer, kingdoms, knights, militant brownies, pixies, unicorn, wizards, wolves. If you are looking for a fantastic adventure novel, then check out Healer of Surflex. Kerlia’s life has been one of tragedy and danger even before she was born. Her father, Terian, has been commissioned by the Lord to train Kerlia on her quest to heal their world from Kernel’s rein of terror. Kernel’s minions have tracked Kelia down in Ferwick Enchanted Forest in their effort to destroy her. As they are about to achieve their goal Kelia is transported to the fairy realm. There she is tutored in the different magical arts by the three clans of fairy folk, the pixies, fairies, and militant brownies. Can a young teenage with her dragon, unicorn, and three white wolves succeed where the mightiest knights have failed? 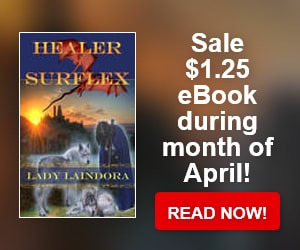 You can find Healer of Surflex in print, ebook format, and audio book. This entry was posted in Events and tagged audiobook, demons, dragons, e-book, fairies, faith, family, fantasy, father/ daughter relationship, healing powers, militant brownies, novel, paperback, pixies, spells, unicorn, wolves, young teenager. This entry was posted in Events and tagged demons, dragons, fairies, faith, fantasy, father/ daughter relationship, healer, knights, militant brownies, pixies, spells, unicorns, war, wizards, wolves. I am looking for a narrator for my Christian fantasy novel ‘Healer of Surflex’. It is about a young girl, Kerlia, that was born with healing powers. It was prophesied that a healer would destroy the reign of terror from Kernel on the Kingdom of Surflex. So Kernel has tried to kill Kerlia before she was even born. At the age of six, Kerlia is transported to the fairy realm where she is to hone her powers for the fight. She acquires three wolves, a unicorn, and a flying dragon that can breathe both fire and ice to help her with the quest. Can a mere child accomplish when the mightiest men quake in terror at the mention of Kernel’s name? This project would be a 50/50 royalty split. Thank you in advance for considering this project. You can find the project at https://www.acx.com/titleview/ALCWIWT2VAUFQ . This entry was posted in Events and tagged ACX.com, demons, dragons, fairies, fantasy, healer, knights, magic, narrator, novel, novels, producer, royalty split, unicorn, wizards, wolves.